All animals have brains, except for a few primitive invertebrates like sponges and jellyfish. A brain is necessary to coordinate the actions of the body, to learn about things, and to make decisions. Animals need brains. They could not survive without them. Societies need well functioning brains too. A society or any large group of people needs a brain to coordinate the actions of the body, to learn about things, and to make decisions. This role is played by government. A large society cannot function effectively enough to thrive without a central government. Thus when a society thrives at first and then fails to thrive in a stable ecological niche, the reason must be there was a flaw in its brain. Something went wrong in its central decision making apparatus. That's where we are today. Global society is failing to survive in the biosphere. Environmental collapse is dead ahead unless society changes course, which is looking increasingly unlikely. We thus conclude that something has gone terribly wrong with society's brain, with the way its central governing mechanism works. What exactly has gone wrong in society's brain? Where is the flaw in our system of government? The symptoms of that flaw are that 100% of the governments of the 190 some nations on our planet are all making the same mistake. They are making decisions that lead to severe environmental unsustainability. But that's too broad a symptom to point to its root cause. So how can we go deeper? It is the last of these that is designed to address the question of flawed decision making. Excessive solution model drift occurs when a solution model works at first and then doesn't. The solution has drifted, due to change in the problem, change in how the solution is managed, or both. The telltale symptom of excessive solution model drift is always the same: failure to correct failing solutions when they first start failing. It happens because of a flawed societal brain. Something is thus terribly wrong in the way governments make decisions. The analysis found the root cause of excessive solution model drift to be low quality of political decisions. That agrees with our animal and society brain analogy. If an animal or a society lives in a niche that should allow that life form to flourish, then the reason for not flourishing must be low quality of decisions. The life form is simply making poor decisions for some reason. Politician Decision Ratings work by giving people accurate feedback on how well each politician is doing in terms of the quality of his or her decisions. The higher the quality, the higher the rating. People will naturally start electing politicians with higher ratings. That in turn will cause politicians to compete among themselves to see who can make better promises while campaigning and better decisions while in office. This will raise the maturity of decision making process, a high leverage point. Here “better” doesn’t mean better for the politician. It means better for the common good. We don’t need self-serving politicians who say anything to get elected and then, once in office, demonstrate they are really working for themselves and special interests. We need people-serving politicians. This can be done by introducing the right feedback loops. Politicians are the people’s elected problem solvers. Politicians, their staff, and the other politicians they work with are a problem solving organization working on one difficult problem after another. Because the more difficult the problem the more mature the process used to solve it must be, the best strategy is to use the most mature process possible. This will have the effect of maximizing the quality of political decisions, just as the many processes that corporations use serve to maximize their profits. If you are politician and are serious about improving the quality of political decisions, then enlist the help of top corporate managers because they are the best there is. Be sure to pick virtuous ones. Presently political decision making quality is low, due to an immature process. This causes legislative decisions to be too easily controlled by corrupt politicians and special interests, notably proxies of the New Dominant Life Form who owe their allegiance to that life form instead of Homo sapiens. An immature process also causes the process to not adapt fast enough to changing times. This creeping obsolescence results in a growing inability to solve new types of problems, which leads to crisis management, bickering, and clever attempts to shift the blame for solution failure to others. A side effect of process immaturity is excessive partisanship, due to the focus of participants on personal or party gain instead of doing what is best for the whole. All these problems would be greatly reduced if we could dramatically improve the political decision making process. This can be done with the Politician Decision Ratings solution element. This has the complexity and power of a double entry accounting and financial management system, but because politicians manage something else entirely, it is totally different. However the principles of quantitative measurement of what you are managing, performance feedback, and continuous improvement apply equally well to political and business decisions making processes. The goal of this process is to improve the political decision making ability of governmental social control models, to the point where: (1) they are self-improving so excessive future model drift is avoided, and (2) they can routinely proactively solve difficult problems like sustainability. The strategy is to create a race to the top among politicians to see who can accumulate the best decision ratings over their career. The long process of legislation creation undergoes a strictly monitored life cycle. The life cycle steps are objective, proposal, enactment, and outcome. For simplicity we will ignore solution evolution, solution management, obsolescence, etc. Below is The Political Decision Making Process. Each symbol is a step in the process. The three symbols with bolded borders are where the key politician or electorate work occurs. If the decision points preceding these steps are of high quality and relevant data is available and also of high quality, then so is the work done in the bolded steps. Note the five reinforcing feedback loops. These powerful forces drive the process toward higher and higher quality of decision making. These loops are weak or nonexistent in the present process. The feedback loops improve the quality of each step. The earlier the step the more quality matters. 1. The Objective Step – Decision Ratings uses a hierarchy of objectives. At the top sits a nation’s standing goals. These are enshrined in its constitution or a similar document. At the bottom are all the bills currently in force. Between the top and bottom is an implied but unwritten set of layers of intermediate objectives. Those doing the ratings work with legislatures to develop a published system for keeping track of the hierarchy. Eventually certain bills will probably be created to authoritatively define portions of the hierarchy. When a bill is first created its objectives are set. These are then rated for four things: difficulty, importance, favoritism, and coherence. The last is how well the objectives support the existing hierarchy of objectives. The last three are then weighted to create an overall rating of quality of objectives. If any favoritism or irrelevancy exists, this will cause a low quality of objectives rating, because that would mean the bill’s objectives clash with the hierarchy. It will not be long before committees set a high quality bar, such as 90%, that the objective rating of all new bills must pass to be developed by committees into full proposals. Who created the objectives is recorded for later use. 2. The Proposal Step – After a bill is fully developed it becomes a proposal. It is then submitted to the raters who rate it on how likely it is to achieve its stated objectives, which is called its success probability rating. This is a type of predictive rating, as opposed to a rating based on how things turn out, which would be an outcome rating. At first the raters must study the life cycles of lots of past bills, calibrate their predictive process, and make educated guesses. With experience and specialization they will get better and better. The raters will themselves be rated by an independent body for how well their past ratings correlate with outcomes, which will allow a confidence level for a rater’s ratings. Multiple rating organizations will specialize in different types of legislation and compete to see who can get the highest confidence levels, because that’s who politicians are going to want to rate their bills. Proposals are also rated on favoritism. Again, it will not be long before congressional bodies insist that a proposal must have at least an 80% or so probability of success and no more than a 5% or so favoritism rating before it may be brought to the floor for final debate and voting. If a bill passes it moves to the next step. Under these conditions we are going to see the instant disappearance of sneaky midnight earmarks, late amendments, and all the trickery that pops out of the sky when bills come out of committee. This is because if any change is made the proposal must be rated again. This takes days to weeks at a minimum, costs a considerable amount of money, and any favoritism or poor quality of decision making that has crept in will hurt the bill’s ratings. If the probability of success falls too low or the favoritism rating rises too high then alternative bills will take its place or it will not be allowed on the floor. The raters record who the authors are for each bill. The simplest way to do this is to see who is on the committee that created it. Better ways will evolve to reflect who did the real work and made or suggested the key decisions. 3. 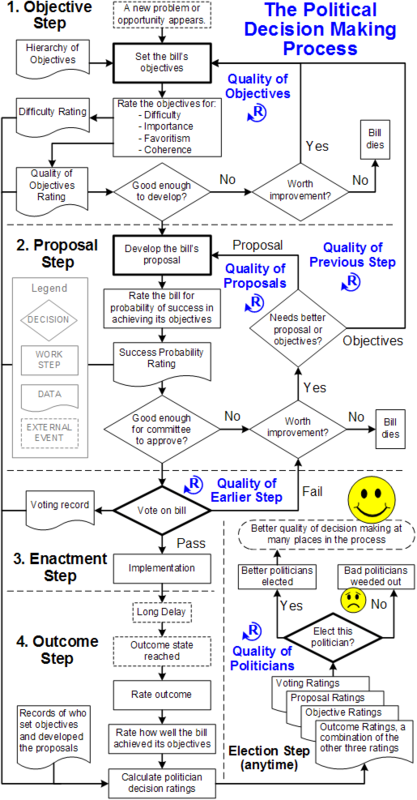 The Enactment Step – If a proposal passes, the raters record who voted for and against it. 4. The Outcome Step – Finally, years later, the raters measure the bottom line: how well a bill achieved its objectives. This is done for all enacted bills. The results are then correlated with enactment votes to see who has the better record on voting for bills that better achieved their objectives. The correlation is then adjusted for the difficulty of the objectives. This gives the voting rating for each politician. The same thing is done for outcomes versus the records of who authored each proposal, plus adjustment for difficulty, which gives the proposal rating for each politician. Finally, the same thing is done for outcomes versus quality of objectives, plus adjustment for difficulty, which gives the objective rating for each politician. Objective ratings are the most important, because they represent the strategies and priorities behind a politician’s work. Next in importance are the proposal ratings. They represent the quality of the bulk of that work. The public will know this and weight the three ratings accordingly, probably around 50% for objective ratings, 30% for proposal ratings, and 20% for voting ratings. The three ratings might then be combined into a single outcome rating. To allow for learning on the job and the errors of youth, recent data would be weighted more than old data for rating calculation. This brief sketch should explain how creating the right feedback loops can dramatically improve the quality of group decision making at all levels of politics. The system will now have automatic accountability. Imagine what the beneficial effects might be. And imagine what problem would already be solved if Politician Decision Ratings already existed. Decision ratings would cause a sea change in the way bills are developed. High ratings would require sound analysis of the causes of a problem, deep understanding of how people and systems behave, a thorough look at all reasonable alternatives, lots of synthesis to create new ideas, a method of picking the best solution path, and techniques to prove that all this is correct and not just highly plausible. Undue personal bias would not be allowed. This of course is exactly how successful corporations have worked for a long time. Congress shall install a formal decision making process on itself that, in its first iteration, follows the process map for The Political Decision Making Process. The process shall include, as its topmost and permanent sacrosanct objective, optimizing quality of life for all living people and their descendents. Once this deep structural change is made, democracy will have the foundation it needs to achieve what has never been possible but has long been dreamed of. "Plato imagines a group of people who have lived chained in a cave all of their lives, facing a blank wall. The people watch shadows projected on the wall by things passing in front of a fire behind them, and begin to ascribe forms to these shadows. 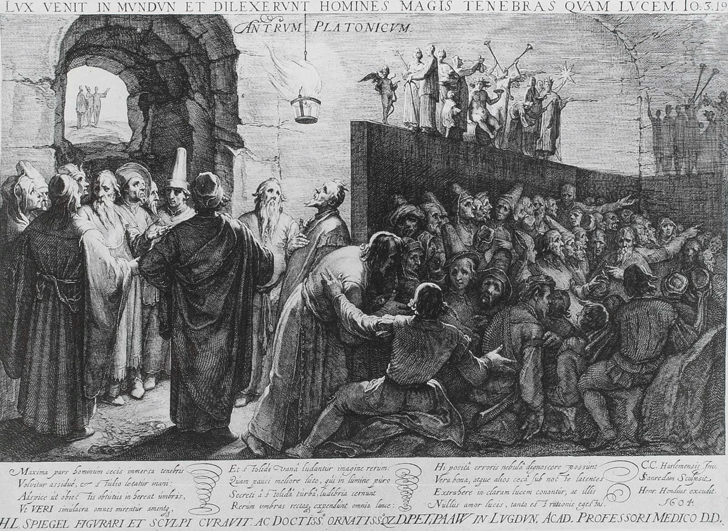 According to Plato, the shadows are as close as the prisoners get to seeing reality. He then explains how the philosopher is like a prisoner who is freed from the cave and comes to understand that the shadows on the wall are not constitutive of reality at all, as he can perceive the true form of reality rather than the mere shadows seen by the prisoners." This vivid passage has so stimulated the minds of millions of readers that numerous illustrations have appeared. The one below is an engraving by Jan Saenredam (1565-1607) after a painting of Cornelis Corneliszoon van Haarlem (1562-1638). In 1516 Sir Thomas More revived Plato’s dream in Of the Best State of a Republic, and of the New Island Utopia. More’s world had few laws, no lawyers, and tolerance of all religions, as well as satirical and symbolic elements. The book’s purpose was to contrast what was desirable and possible to what was happening at the time in Europe. In 1888 Edward Bellamy kept the dream alive with Looking Backward: 2000-1887. According to the forward in the 1960 edition, p vi, “It is one of the few books ever published that created almost immediately on its appearance a political mass movement.” Interestingly, one of the major themes was the dangers of the stock market. These works had one central theme in common: a well formed vision of a good world, one abundantly filled with examples of quality of life. Starkly missing were the evils that plagued people’s lives, like bad rulers, war, poverty, famine, pestilence, crime, greed, and endemic corruption. These good worlds never dipped into evil. They were always basketfuls of near perfect goodness, which seemed perpetual. Can it be done in the real world? Is it possible to engineer the new checks and balances necessary to take society into a good world and keep it there perpetually? If the right new feedback loops can be installed, why not? Hidden deep in the system’s structure is the loop whose dominance matters most. 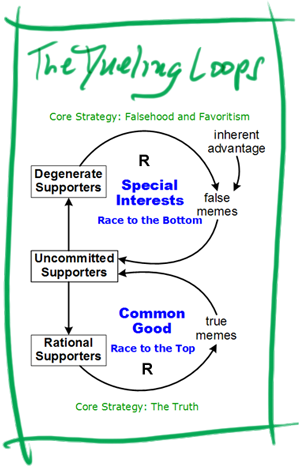 It’s the second one added to the Dueling Loops model: The Race to the Top among Politicians. This is the loop of goodness. It’s the loop each of the best-of-all-possible-worlds writers was fantasizing about without consciously knowing it. The loop explains why their plots centered on good and bad rulers. Rulers are politicians. What each writer was actually describing was what might happen to a human system if a political race to the top became dominant and stayed that way. They were all essentially describing what a permanent race to the top would look and feel like. Their dream, my dream, and I hope your dream, is for this universal dream to soon come true. For that to happen requires something like the analysis and solution elements presented on this website. One of these solution elements must install something like Politician Decision Ratings. Perhaps the short new law described above will be part of that change. Each nation has thousands of laws already. But this one is totally different. As short as it is, it will quickly be seen as the most important law of all, because it maximizes the chance of achieving all the others over the long term. The last words in that carefully designed new law are “and their descendents.” These three words are the ones that historians, ten thousand years from now, are going to thank us for the most.